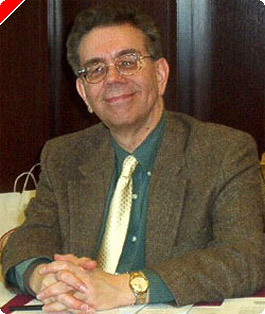 This article originally appeared on Pokernews.com, January 13, 2007. 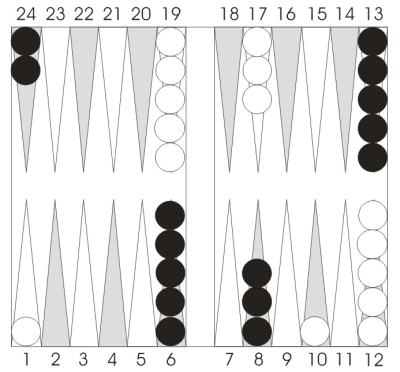 In backgammon, most hits are done for one of two reasons: to gain ground in the race, or to attack a key point. A rarer, but still important use of the hit, is a defensive idea called the tempo play. Here the plan is to prevent your opponent from using his whole roll to do something good. By hitting (usually in your home board), you force him to spend half his roll coming in from the bar, so he's not in position to do something devastating elsewhere on the board. Let's first take a look at a common situation where beginners make a tempo hit incorrectly. White has won the opening roll with a 6-3 and run his back checker to the outfield. Black now rolls an innocuous 5-2. Many beginners will go astray here and play 6/1*, 24/22. Since it's a hit, this looks somewhat active and aggressive, but it actually doesn't accomplish anything. White had no powerful threats that Black needed to stop, and the checker left on the one-point is both immediately vulnerable and a long-term liability. A better play is the simple 24/22, 13/8. It does a few good things (unstacks the midpoint, adds another builder to the 8-point, and splits the back checkers), but most important, it doesn't do any bad things. Now let's look at a very different situation. Black is ahead in the race and hence has less timing than White. This means that Black will actually have to escape White's prime: waiting for it to collapse is not an option. 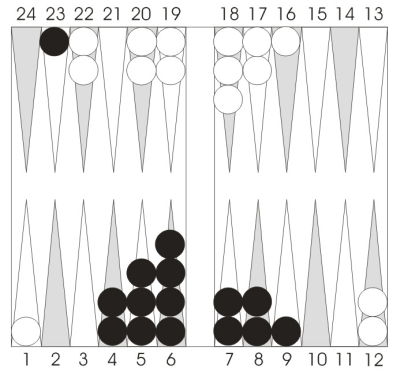 If Black is going to escape, he'll need to throw a two at some point, andguess whathe's just thrown one. So there's a really strong case for playing 23/21 with the deuce. Once the checker gets to the 21-point, White will point on it or at the very least hit loose. Black needs a diversion to keep the dogs at bay, and 5/1* fits the bill perfectly. It has an added bonus (don't miss this) of winning more gammons for Black than any other play. It's true that shoving what was a nice builder down to the ace-point weakens Black's chances for a full prime, but changing a priming game into a sudden blitz is often the right strategy, especially when neither side has an anchor. The difference between these two positions is simply the amount of immediate danger that Black faces. You don't like to hit loose deep in your home board, both because getting hit back is usually costly, and because the checker becomes a future liability even when it isn't hit. So to make the hit correct, you need to be facing very serious threats. In Position 2, White has those threats; in Position 1, he doesn't.